UK telecoms regulator Ofcom is to end price controls on home line rental and phone calls at BT after 22 years. Ofcom said that competition for customers meant market forces were sufficient to ensure the former monopoly's prices stayed competitive. BT has agreed to restrict increases in basic line rental, protecting those for whom this is a large chunk of their phone bill. The changes will come into force from 1 August, Ofcom said. Many companies are now offering combined telecoms and broadband internet packages, and the Ofcom announcement comes a day after media firm BSkyB launched its own broadband package. Charges for residential customers for line rental and calls have been controlled by the regulator since BT was privatised in 1984. 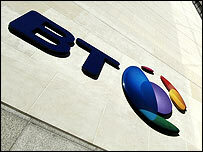 More than 10.7 million households and businesses no longer have BT as their phone provider, according to Ofcom figures. As well as landline rivals, it is also under pressure from mobile phone use which makes up 31% of all UK call minutes. BT welcomed the changes saying it was "good news for customers". "The UK has enjoyed one of the most competitive telecoms market in the world for a number of years and a freer BT will deliver even better value and innovation for our residential customers," said Ian Livingston, chief executive of BT Retail. "We will now look at how we can simplify our pricing structures and make them more user-friendly."